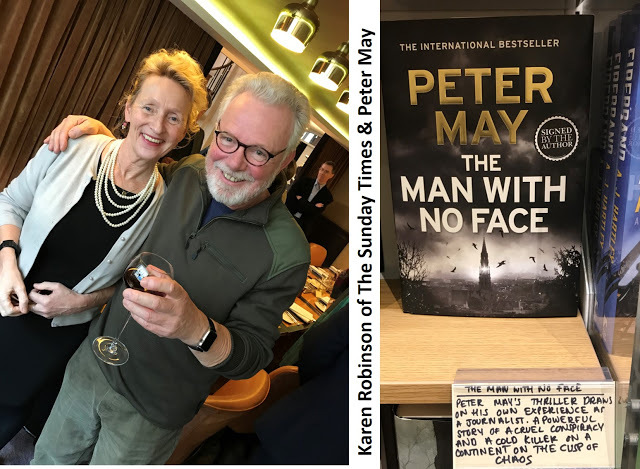 The gathering publisher Jon Riley and Hannah Robinson of Quercus / riverrun organised, for Peter May’s 2019 novel was most eclectic, and amusing. 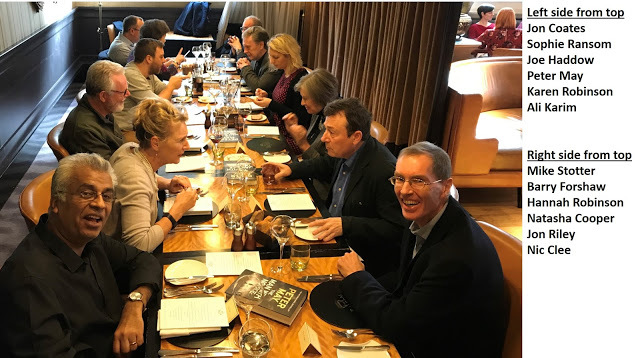 As avid bibliophiles, writers, journalists, literary people, we often live within our ‘heads’ as well as staring at a PC screen; so when we meet-up in the real world, it is a delight. Sophie Ransom had organised a private table at The Balcon, in Pall Mall. I was amused when I arrived at St James’, because opposite the restaurant is the HQ for The Institute of Directors [IOD]. It’s a building I know well, as a former businessman. It was good to meet up with my friend ‘Six-Gun’ aka Mike Stotter just prior to lunch, as he’d been unwell with a trapped nerve [‘sciatica’]; while I had just recovered from a terrible case of winter influenza. So, after a quick catch-up, we headed into The Balcon. 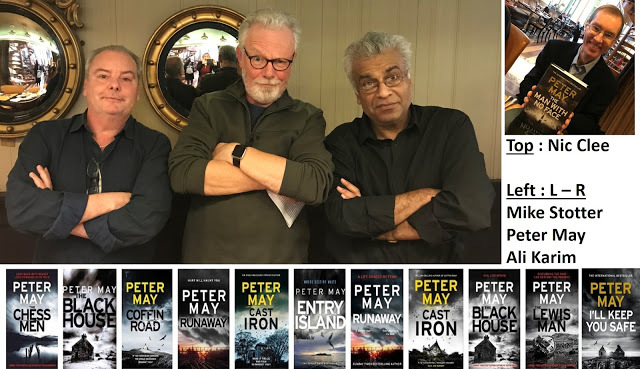 The interesting aspect of Peter May’s 2019 release was it was a re-issue [of a kind] dating back to Peter’s journalistic days, and is in my opinion, and that of many others an extraordinary work, and its timing for reissue most prescient considering the current geopolitical issues surrounding Great Britain’s political relationship with the European Union. May’s latest thriller is extraordinary, and very different. Originally penned in the late 1970s, and published in 1981 as Hidden Faces – it was the former journalists' third published novel. It has not been re-worked, just ‘lightly retouched’ because it is curiously relevant, forty years on. 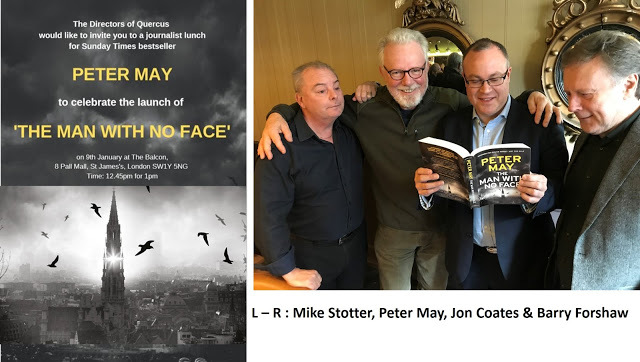 May prefaces the work with a short introduction that explains how The Man With No Face found itself appearing in 2019, crediting his editor and also mentioning the young man who wrote it – his younger self. The key however is the relevancy of the story, when contrasted against the geopolitical situation in the World. The sad aspect is that despite all the technological change that has occurred around us, when the novel first appeared – the reality is that little has altered in the nature of humans. Before we took our seats, Peter told us little about those days when he worked as a young journalist not unlike his character Neil Bannerman, having to rely on payphones, typewriters, shorthand and notebooks, unlike todays' cellular phones, internet, and the advent of the so-called ‘fake news’ era. Whilst entirely fictional, The Man With No Face is heavily inspired by real life events that took place in the 1970s. These were then supplemented by extensive research by Peter May, in order to create a realistic, hard hitting crime thriller. The original novel was first written in the 1970s, when May was a journalist and living through and reporting on political and social upheaval, with two general elections in 1974 and another to come in 1979, and an epic battle unfolding between left and right as trade unionists battled Thatcher. The 1970s was also the beginning of Britain’s EU membership which with Brexit negotiations in full swing, gives the publishing of The Man With No Face now a timely relevance. During the 1970s, May was writing for The Scotsman, and reporting on the social upheaval every day. He wanted to set a story against this background, but based between Scotland and Brussels, the beating heart of Britain’s new future endeavour. Peter made the long journey by train from Glasgow to Brussels in the bitter winter of the late 1970s. Whilst at the time travelling by train was a financial necessity, Peter later used this experience to recount the killer’s journey to Brussels, allowing the murder weapon to go undetected. Whilst in Brussels, Peter identified the key locations he wanted to use in his story, and managed to gain access to Berlaymont, HQ of the EU, giving him a unique insight into how correspondents and politicians worked in those early European days. There are many parallels to the way they work today. Peter drew inspiration for his plotline from real events. The unsolved murder of French MP Prince Jean de Broglie in a dark Paris street in 1976, coupled with reading an article about Nadia Chomyn, the autistic child of Ukrainian science graduates who had settled in the UK, and her extraordinary artistic abilities, served as the basis to Peter’s storyline. Peter did extensive research into autism, and visited a clinic for autistic children in Glasgow. Sadly, upon coming to re-write this book for the second draft, Peter discovered that Nadia Chomyn had passed away in 2015. There are two men on their way to Brussels from the UK: Neil Bannerman, an iconoclastic journalist on Scotland's Daily Standard whose irate editor wants him out of the way, and Kale—a professional assassin. Expecting to find only a difficult, dreary political investigation in Belgium, Bannerman has barely settled in when tragedy strikes. His host, a fellow journalist, along with a British Cabinet Minister, are discovered dead in the Minister's elegant Brussels townhouse. Apparently they have shot each other. But the dead journalist's young autistic daughter, Tania, was hidden in a closet during the killings, and when she draws a chilling picture of a third party—a man with no face—Bannerman suddenly finds himself a reluctant participant in a desperate murder investigation. As the facts slowly begin to emerge under Bannerman's scrutiny, he comes to suspect that the shootings may have a deep and foul link with the rotten politics that brought him to Brussels in the first place. And as Kale threatens to strike again, Bannerman begins to feel a change within himself. 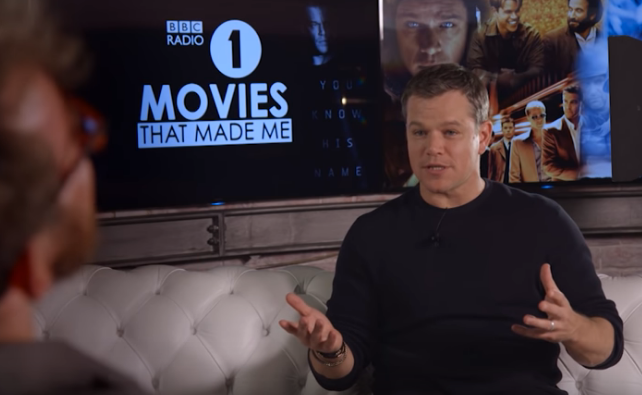 His jaded professionalism is combining with a growing concern for the lonely and frightened Tania, and a strong attraction for a courageous woman called Sally, to draw him out of himself and into the very heart of a profound, cold-blooded, and infinitely dangerous conspiracy. 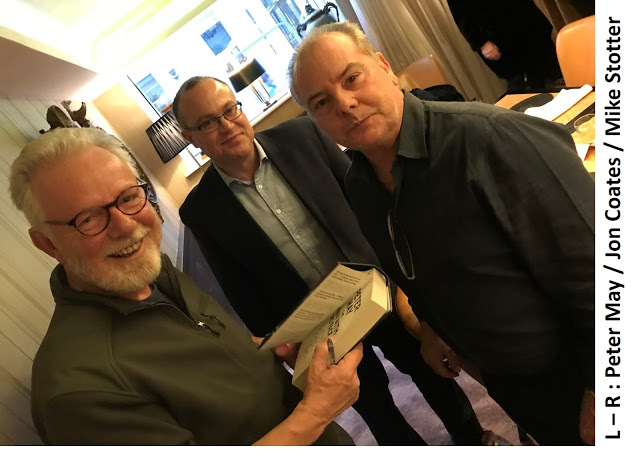 So after an excellent lunch and laughter, Mike Stotter and I passed our thanks to riverrun / Quercus Publishing for a memorable afternoon. For American Readers, the QUERCUS US publication date for THE MAN WITH NO FACE is 1st March 2019. 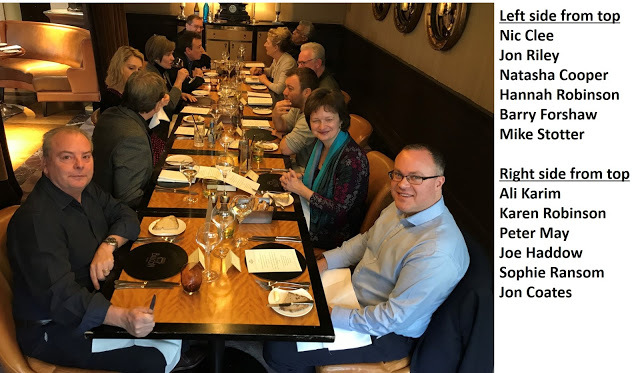 During the lunch I found myself sitting next to Karen Robinson, Peter May, and opposite Nic Clee, Jon Riley and Natasha Cooper. At one point we discussed our thoughts of this new BBC production, screened over Christmas Holiday. THE ABC MURDERS had split public opinion. It appeared the Christie ‘purists’ disliked screenwriter Phelps’ reworking, and particular vitriol was placed upon John Malkovich’s portrayal of Hercule Poirot. Sarah Phelps amusingly responded by saying “….See you next time, when I rewrite Pride and Prejudice in a crack den….” Which made me smile as Nic Clee and I both enjoyed it. Though Nic had reservations about some of the liberties that had been taken over the source material. I however, had been hypnotised by this production. I enjoyed the subtle mention of the growing xenophobia, of that era making it relevant to today’s geopolitics. 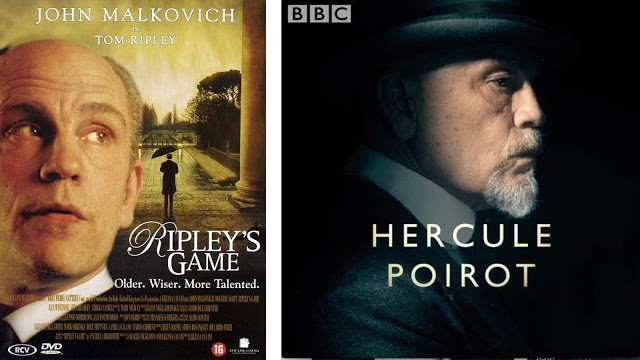 Many had taken issue with the backstory regarding Poirot, as well as Malkovich’s weird accent. I am an admirer of John Malkovich as an actor, especially his brilliant portrayal of Tom Ripley in Liliana Cavani’s 2002 adaptation of Patricia Highsmith’s RIPLEY’S GAME. Over lunch I recounted meeting with David Levien, an American screenwriter who co-wrote [with Brian Koppleman] “Rounders”. This was when Levien had penned a few crime novels, way before he and Koppleman found huge success with BILLIONS. 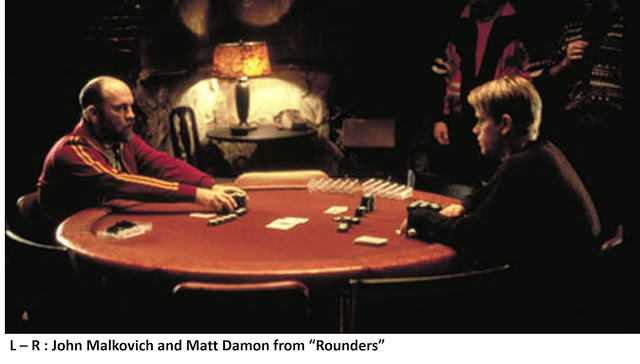 Rounders is a very interesting independent film which featured a young Edward Norton and Matt Damon. John Malkovich had a very small part, playing a Russian Mobster. From the Shots Team "......have a fine 2019....."